Matt Kidd was in fine all-round form for Biurne against Uppingham in a Stamford Charity Cup semi-final. Bourne are hot favourites to reach their second T20 Final of the week when hosting Wisbech Town in a Jaidka Cup semi-final at the Abbey Lawns tonight (June 20, 6pm). 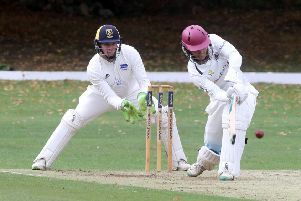 Bourne, Jaidka winners in 2016 and runners-up in 2017, crushed Uppingham by eight wickets in the semi-final of the Stamford Charity Cup on Monday (June 18) when Notts Academy player Joey Evison struck an unbeaten 54. Ramsey await the winners of tonight’s tie having knocked holders Peterborough Town out in the first semi-final last week. Bourne will play Stamford Town in the final of the Charity Cup on July 9. They play Uppingham in the semi-final of the Stamford KO Shield on Monday (June 25) when Castor also host King’s Keys in a last four tie. Matthew Kidd struck 44 and took four wickets in Bourne’s win over Uppingham. Uppingham were dismissed for just 112.